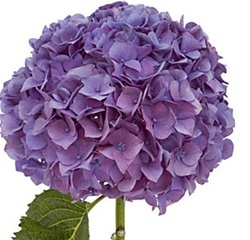 Purple Hydrangeas have clusters of small 4 point shaped flowers. Our fresh cut hydrangea flowers have a large blooms that can used by themselves or with other flowers to create beautiful, long-lasting wedding bouquets & floral arrangements. Free Shipping! 1. Cut flower stem ends to create fresh surface to absorb water and remove any faded stem base. 2. Remove all foliage below the water line and place in a clean container filled with cool water and, optionally, floral preservative. 3. If you do not add floral preservative, change the water and re-cut the stems every day or so. 4. If you purchased your flowers ahead of time for a special event, cut the stems and place them in water (and floral preservative if you choose) as above. 5. Place your hydrangea in an area away from direct sunlight until ready for your event. We also recommend cooler temperatures and high relative humidity if possible. For your Wedding or Special Event, we recommend that you have your Wholesale Flowers or Wedding Flowers delivered 3 days before the actual event. For a weekend event, your flowers should be delivered on the Wednesday (or Thursday at the latest). Schedule lilies 3 to 5 days before your event so they have time to open. We use FedEx for overnight delivery service. Your flowers will most likely be delivered before 10:30am. If you are in an extended delivery area, they should arrive by 5 p.m. Contact FedEx for the guaranteed delivery time for your delivery Zip Code. Deliveries are available Tuesday through Friday. We encourage delivery by Thursday. If there are any weather delays, that will allow an extra day for delivery. Carriers will not make a delayed delivery on Saturday. MyFlowerBuyer.com is not responsible for delivery delays. You should receive an automatically generated tracking number by email the day before your scheduled delivery date. You can use it to track your package online at www.FedEx.com. FedEx might require signature at time of delivery. Please arrange to have somebody at the delivery location to ensure proper delivery. If you miss your delivery, please contact FedEx at 1.800-GO-FEDEX directly with your tracking number to reschedule delivery. If you have ever signed a door tag by FedEx authorizing them to leave a package, all future packages will be delivered without a signature requirement. Each order must have a working telephone number. FedEx will not accept any orders without a working telephone number. Please review your shipping address and Zip Code carefully. If you provide the wrong shipping address, we are not responsible for any problems that may result. Any shipping redirects or changes will incur a $10 fee. Changes may not be feasible as the delivery date approaches, especially once the shipping tracking number has been assigned. MyFlowerBuyer.com is not responsible for packages that are received before or after the specified delivery date, are lost, stolen or damaged once in the hands of the carrier. In the event that there is a delay with your package, please contact FedEx. Natural Purple Hydrangeas have a single bloom, a globe composed of numerous clusters of small four-petaled pinwheel flowers with serrated edges. They are available year round from our partner farms in Colombia and Ecuador. Hues may vary with where they are in the growing cycle, time of year, etc. Sometimes you will find them enhanced with watercolor-brushed hints of blue, pink or white. Like snowflakes, Mother Nature makes no two hydrangeas alike! Premium Hydrangea globes vary from 5 to 9 inches diameter. Hydrangeas ship with water bags and cotton attached to each stem to keep the flower hydrated during shipping. Properly cared for, the expected vase life is 5-7 days or more. Dry them out and the blooms make good decorations for many months and years! Hydrangeas are living things, and may vary in size and color as they go through their growing cycle. Also, due to computer monitor variations, they may differ somewhat to the colors featured here. Hydrangeas have long been popular in Japan and are symbols for perseverance, understanding, and thanks. The word 'hydrangea' means water barrel. We have the best technology for the care and handling of fresh wholesale flowers. We take great pride in going that extra mile to ensure you receive beautiful and fresh when you place an order for wholesale flowers. Cater to the bride to be? Wedding planner? You can find the best selection of a wide assortment of wholesale wedding flowers shipped direct from our worldwide farms at fabulous prices. It’s amazing the offerings you can produce when dealing with wholesale wedding flowers. The possibilities are endless. We hope you choose us to assist you in your purchase of wedding flowers. We guarantee you will love the care and handling we assert with each delivery. My Flower Buyer also offers fresh bulk flowers for any occasion. Choose from a wide selection of Hydrangeas, roses, lilies, orchids, callas and gerberas shipped from our partner farms. You will love the ambiance that only flowers can create. We offer a complete product line of wholesale flowers and wedding flowers year round, shipped direct from our farms worldwide. Our partner farms are in Colombia, Ecuador, Holland, Thailand, Costa Rica, California, Florida, Hawaii and other countries. MyFlowerBuyer.com grows and imports fresh wedding flowers all year round.